When I had just turned 13, The Varsity Show allowed teens from 13 years of age to seniors in high school to dance on the show. I got all spruced up in my white shirt and bow tie, yes you read it right, and went to the KTVA studio in the McKinley Building near down town Anchorage to dance on the show. My "date" was my 12 year old sister Anna, who was only 12 but looked older. When we arrived at the studio, The Varsity Show staff told my sister she could go in, but I couldn't because I wasn't old enough. My sister told them I was 13 and very reluctantly they let me in too. Talk about embarrassing. Then in my Junior year of high school I became interested in a career in television and motion picture production. At the time, my mother Louise Dougherty, was working at Hewitts Drug Store in downtown Anchorage (before the 1964 earthquake). My mom knew a man named Jeff Bowden who came into Hewitts to eat lunch at their lunch counter. Jeff worked at KTVA and I could talk to him about my interest in television production. When I met with Jeff at the Hewitts lunch counter he told me I should audition for The Varsity Show. A few weeks later, they announced auditions for the show. On the day of auditions I went to the studio in the McKinley building. The auditions were set up so you had to face a firing squad of current Varsity Show crew members sitting in front of you behind a long table. There was a music stand for me to stand behind as I answered a bunch of questions. Now I wanted to be on the camera crew, so what happened next caught me totally by surprise. Near the end of my interview, one of the current Varsity Show crew members got up with a piece of paper in her hand and walked over to me. She placed the piece of paper on the music stand in front of me and said, "here's a script, we'll give you a few minutes to look it over, then come back and read the script for us." I didn't want to be in "front" of the camera, I wanted to be on the camera crew. But because I wanted to work on The Varsity Show, I was prepared to walk over hot coals if I had to. So I took the script into the shadows in a dark corner of the studio and started reading it to myself. In what seemed like only about 30 seconds, I heard "Mike, are you ready?" I quickly came out of the shadows, calmly walked back to the music stand like I owned the place, and read the script like my life depended on it. For my troubles, I was told "thank you, and if you make the crew, we will call you this week to attend a meeting next Saturday here in the studio." Our family didn't have a telephone, but I gave them the number of a family friend. The week went by and no call. Then came Saturday and I was wondering what I had done wrong at my audition. Suddenly there was a knock on our front door. I opened the door and a Yellow Cab driver was standing there in front of me. "You Mike Dougherty?" said the cab driver. "Yes" was my snappy reply. "We'll you're supposed to go to the KTVA studios for a Varsity Show meeting." Wow... I had made it. I was an official Varsity Show crew member. My career in television had begun. During my first year on the Varsity Show, our host Ron Moore, a very popular local DJ, was not able to do the show one week. So they choose four varsity show crew members to each host 15 minutes of the show. They chose 3 crew members who did commercials to host the first 45 minutes, and they chose me to host the last 15 minutes. This was a live TV show, so if I blew it, I was going to blow it in front of the entire Anchorage, Alaska viewing audience. Gulp. I even had to do my first live interview with 4 cheer leaders. So now I knew why I had been asked to read that commercial in my audition. Just 2 years later I was the co-host of The Varsity Show with Anchorage DJ and KTVA Morning Show host Roger Latham. 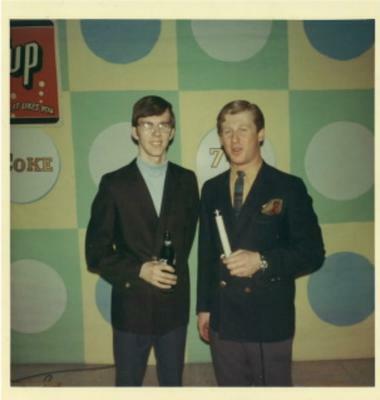 Then, when Roger left for Hollywood, I became the host of The Varsity Show through the 1969 season. While hosting the show, I met the lady who would become my wife. Mary was a staff dancer. Shortly after we were married I turned hosting chores over to Anchorage DJ, Jerry Rose (Peter Bie) who hosted the show's last season. 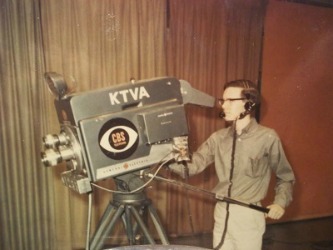 And by the way, thanks to KTVA's Augie Hiebert and the Varsity Show, I had a 30 year career in television and motion picture production. Thank you Augie. I always love to hear your stories! I wish we had encouraged Roger to put some of his in writing, as he had many great ones! You are a blessing to us all! Keep em comin! Thank you Teresa. I appreciate your kind words. Yes Roger Latham had a lot of stories from his work in both radio and television. I was very surprised when Roger agreed to have me co-host the Varsity Show with him. As it turned out, we worked well together in front of the cameras. I suspect that Roger had a lot of Varsity Show memories. Great to hear about your life after high school! I was in Fairbanks and Valdez then. Eric, great hearing from you and I hope you will post your Alaska stories here on Anchorage Memories. I used to love to watch my brother Otto on "The Varsity Show"! He was such a good dancer, he was friends with Ron Moore. Those were the days! My brother passed away May 31st, 2016. He will be missed. So sorry for your loss, but thank you for honoring your brother here on these pages that pay tribute to The Varsity Show. Join in and write your own page! It's easy to do. How? Simply click here to return to The Varsity Show.